Planning a family get-together or dinner party? If so, then make sure to try this mini quiche recipe. 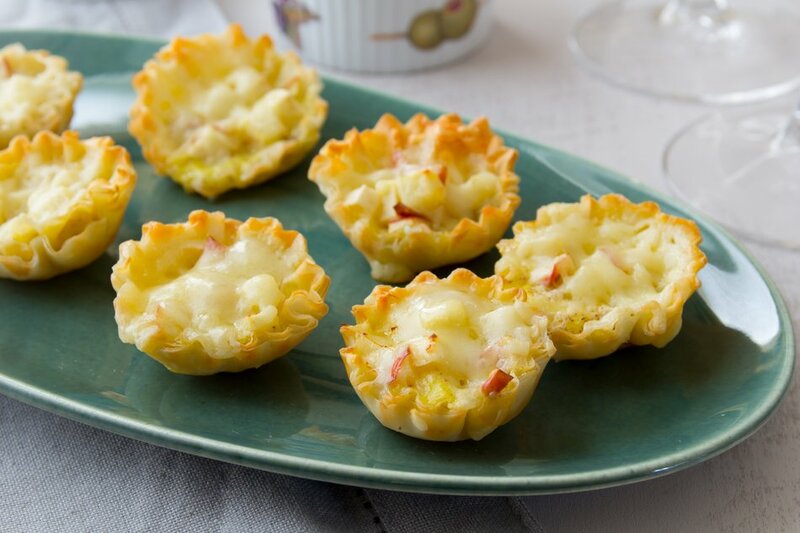 As far as appetizers go, mini filo quiches are both satisfying and delectable, and they'll surely be a hit with your dinner guests. These quiches feature a delicious combination of apples, nutmeg, pepper and six ounces of Cabot Farmhouse Reserve, and we recommend baking them until they're perfectly puffed up and golden—don't forget to let them cool for at least three minutes before serving! Also, after trying this recipe, please make sure to rate and review it—at Cabot, we take pride in everything we offer to our customers, and want to make sure that you enjoy this recipe tremendously. This mini quiche recipe is perfect finger-food for just about any dinner party. This particular recipe makes about 45 shells, and we recommend using Cabot Farmhouse Reserve. However, if you don't have access to the Farmhouse Reserve, we also recommend using Cabot Extra Sharp Cheddar—it packs just as much as flavor as the Farmhouse Reserve, and it also has an enjoyable tangy-factor that you'll love. At Cabot, we take pride in all of our award-winning cheeses; so if you get the chance, be sure to try them all! Cabot is a large farm family owned dairy cooperative, so we understand just how important family is. We're extremely confident that these recipes will be a hit with your family, but we want to hear what you have to say about them—after you've tried this mini quiche recipe, make sure to rate and review it. PREHEAT oven to 350°F. Line a baking sheet with parchment or foil. LAY phyllo shells out on prepared baking sheet. Divide apple among the cups. Beat eggs with half and half, salt, pepper and nutmeg. Transfer to a glass measuring cup. Pour carefully into phyllo cups, dividing evenly. Top each with cheese. TRANSFER carefully to the oven and bake until the filling is puffed and golden, 15 to 17 minutes. Let cool at least 3 minutes before serving.